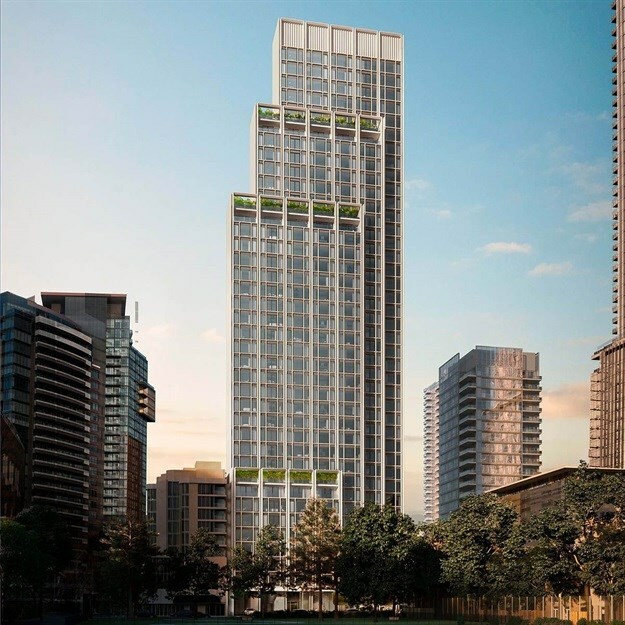 Foster + Partners has revealed its new 41-storey residential tower for Toronto - stepped back from its from facade, the design prevents "shadow falling on the adjacent park and school yard". Named 50 Scollard, the tower will include community-based amenities, heritage restoration, high-end luxury residences, and public green space. Located on the corner of Bay and Scollard Streets in Yorkville, the new development aims to enhance the connection between the Jesse Ketchum Park to its west and the larger Yorkville Green Corridor to the south by creating a new public plaza at the corner of Bay and Scollard Streets, where a heritage building currently stands. "The innovative proposal seeks to relocate the entire building to the south-eastern corner of the site, thereby freeing up space in front of the residential tower," said the studio. "The form of the tower also steps back dramatically, adding volume to the landscaped plaza, which features a sculptural tree hedge – the space can be used as a performance area for staged events, screenings and projections, to host farmers’ markets, for festivals and open-air dining events." "Shops and restaurants within the heritage building and tower, including the restaurant on the third floor, provide active social spaces for both residents and public, making a positive contribution to the surrounding urban realm." "The building has truly evolved from its context, a timeless addition to the Toronto skyline. The massing was sculpted to minimise the shadow falling on the adjacent park and school yard, while maintaining a purity of geometry and structural expression," said Nigel Dancey, head of the Foster + Partners studio. Setting itself apart from the usual 'green glass tower', the building takes cues from the colours and textures of the surrounding urban fabric, giving the tower a materiality that relates to the unique character of the borough. The studio proposes a pure geometry and structural expression to provide "a timeless quality", creating a harmonious relationship between the tower and the heritage area of Yorkville – a new addition that makes a positive contribution to the community. "Public engagement was an integral part of the design process, where we worked hand-in-hand with the city and the local residents to evolve a design that resonated with the historic character of the district, while being very much ‘of its own time'," added Dancey. The building will include expansive private terraces as it steps back at upper levels, and a majority of residential units feature dual aspect views to the Don Valley Parklands to the east and over Yorkville to the west. "Expansive layouts, full height windows and Juliet balconies, all come together harmoniously to provide a luxurious living experience," added the studio.